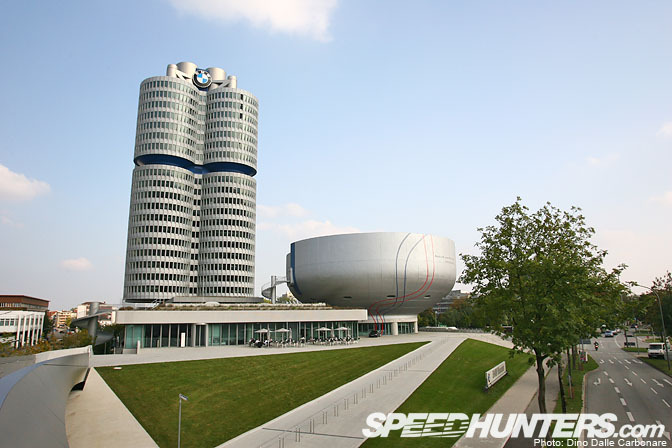 …and check out the recently revamped BMW museum, right under the 101 m tall HQ towers. 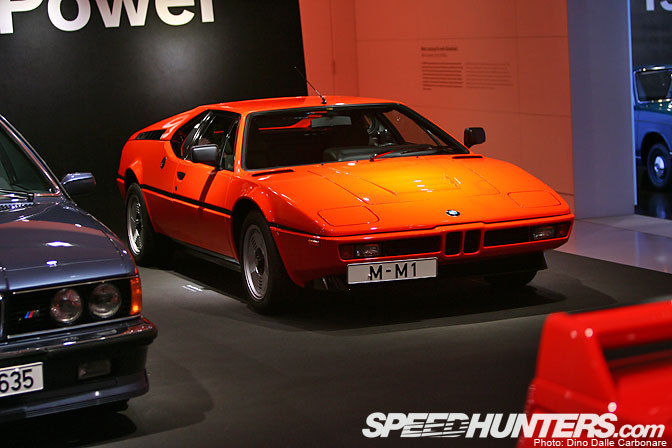 To pay homage to one of their most iconic models BMW decided to resurrect the timeless lines of the M1 albeit with a 21st century feel to them. 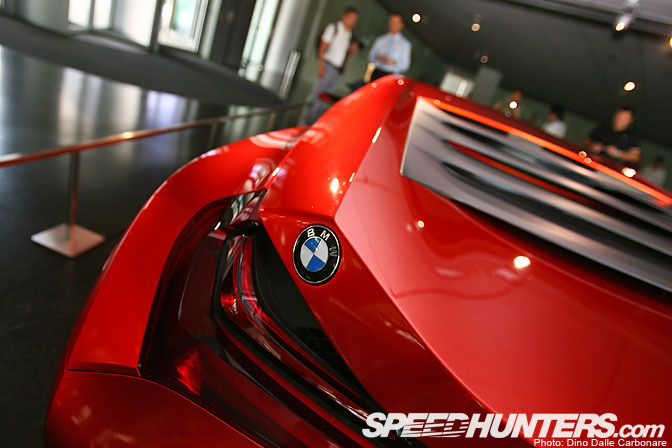 The M1 concept takes center stage in the main entrance of the building, so visitors are immediately confronted with those striking forms as soon as they set foot in the museum. 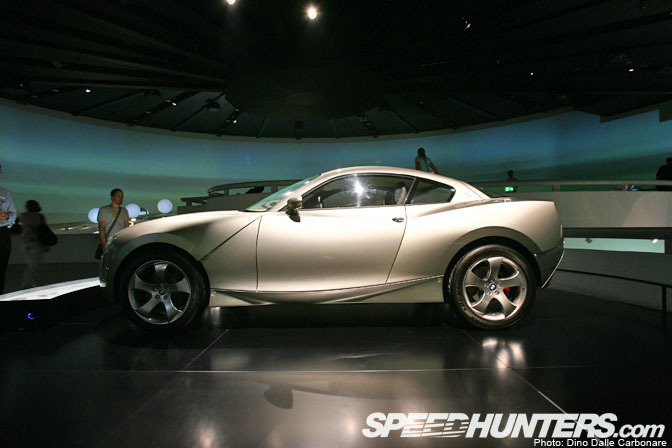 I think any car fan out there would love to see it make it into production, but that is going to be highly unlikely. 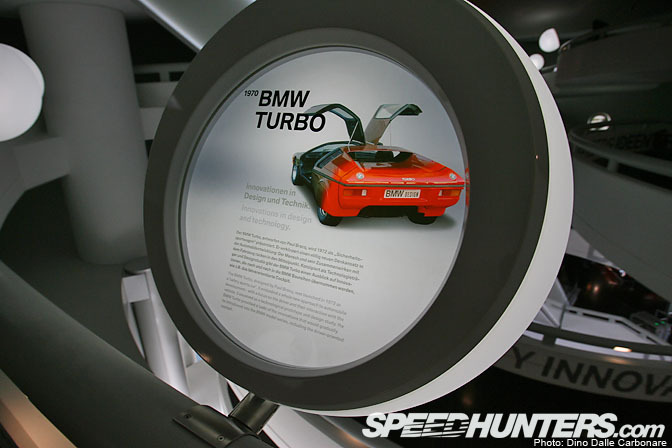 …like the 1970 BMW Turbo, a sort of "sports-safety prototype" which introduced innovations like the driver oriented dashboard to production BMWs, a key feature still implemented today. 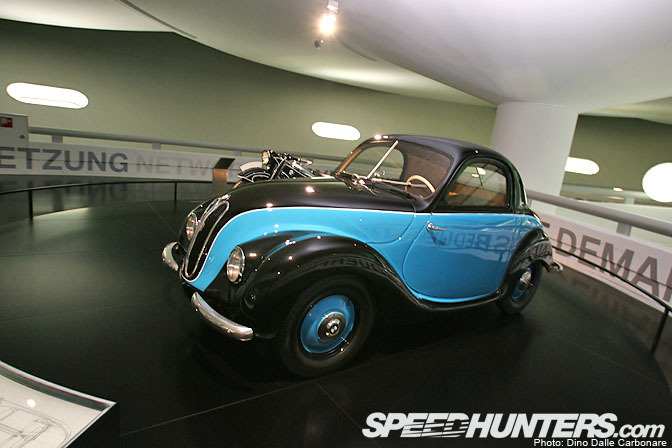 The pursuit of lightness was something BMW got into very early, demonstrated by the 531, which thanks to a hand molded aluminum body managed to lower the weight of the car to just 500 kg. Due to cost reasons however, this kind of building technique never really took off. 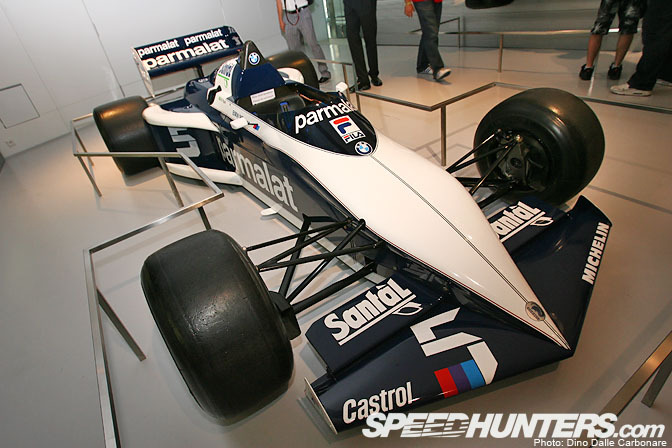 Here is one of only two BMW Turbos ever built, the second one we saw in the BMW Group Classic collection. You will have to wait for Rod's post on this. 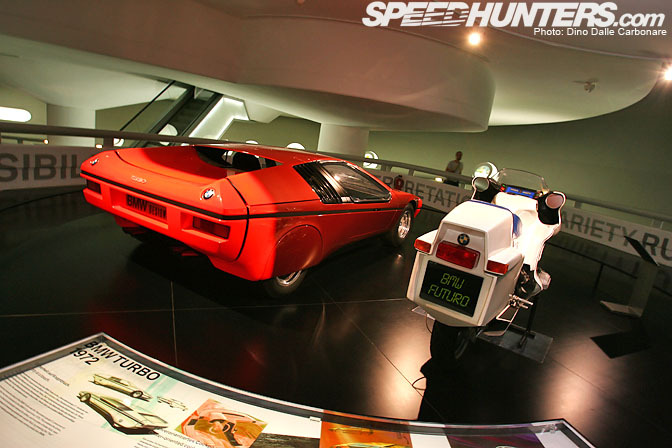 BMW, since its beginnings, a builder of motorcycles, also produced this turbocharged Futuro concept. Must have been tricky to ride! …you may remember it for its extreme Bangle design, sporting a curious asymmetrical rear section which opens up to reveal the rear seats. 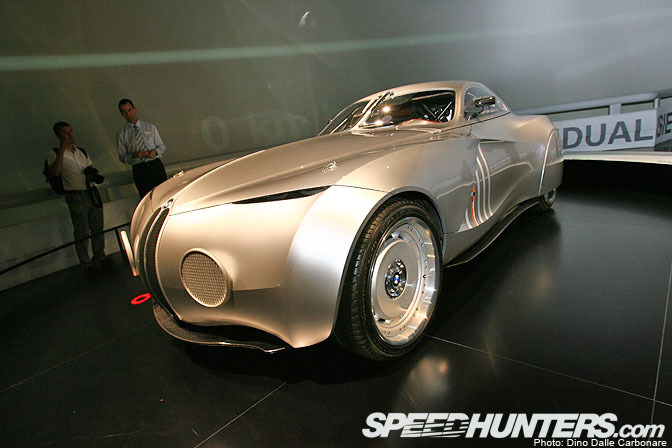 Another futuristic creation is the Mille Miglia Concept Coupe from 2006, showing off a 50's silhouette highlighted by sharp Bangle-esque creases. 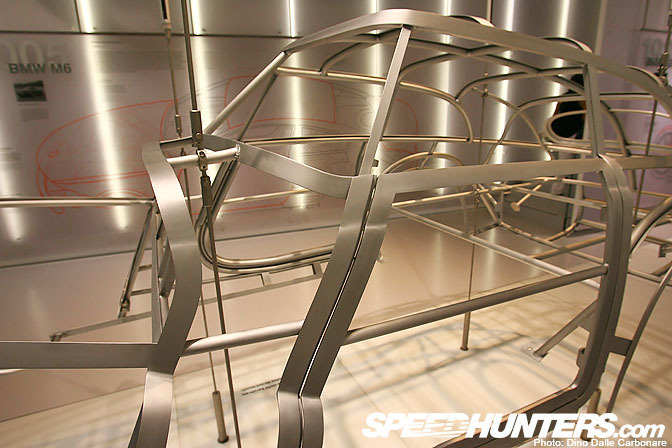 The chassis is stiffened up with a race-car-like roll-cage as the whole roof piece lifts backwards to reveal the retro cockpit. 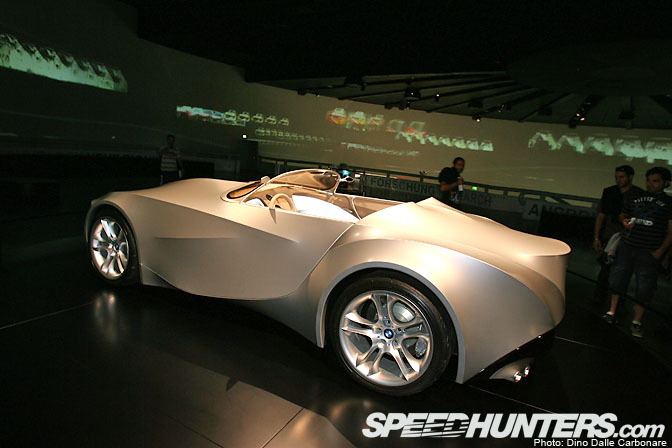 It was cool to finally see the GINA concept with its skin-like body. It was intended as a design-study exploring alternative materials such as synthetic fabrics (instead of the usual rigid panels) capable of changing shape when needed. Apparently the fabric has a finite life which is a pity as we were unable to see its shape-shifting abilities in action. Coming back down past the M1 concept I couldn't help grab a few more shots. 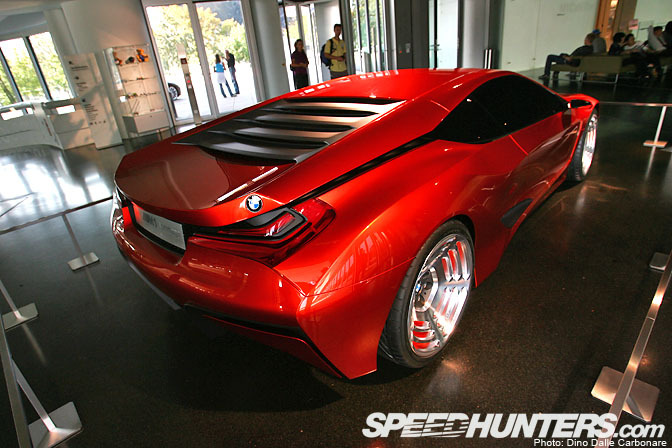 I'm sure if BMW put this thing into production it would sell like hot cakes! 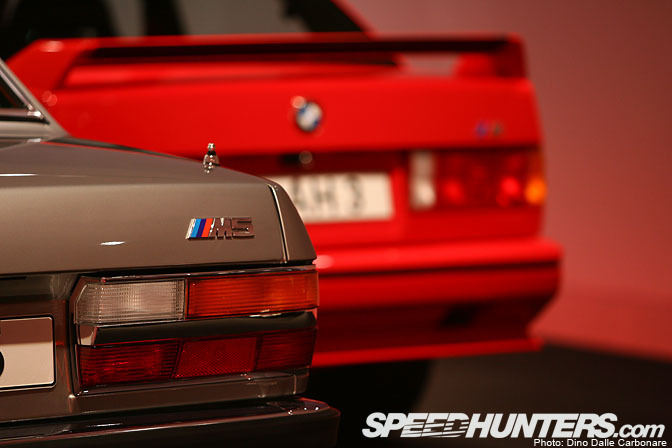 Like the old M1 there are two BMW badges on each corner of the rear hatch, a nice little touch harking back at the original. 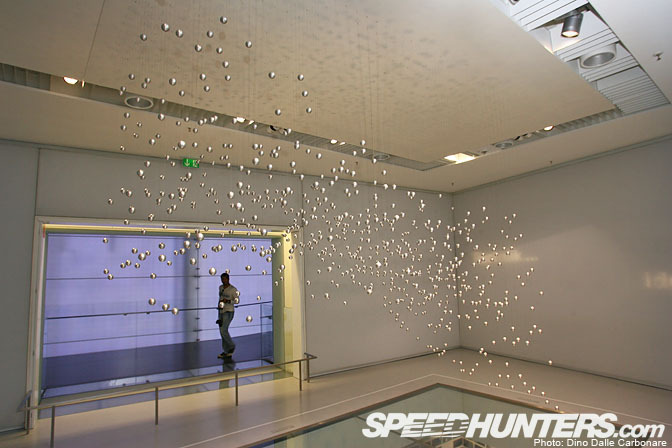 …as the close to 800 stainless steel balls started to come alive dropping down towards the ground at different rates. 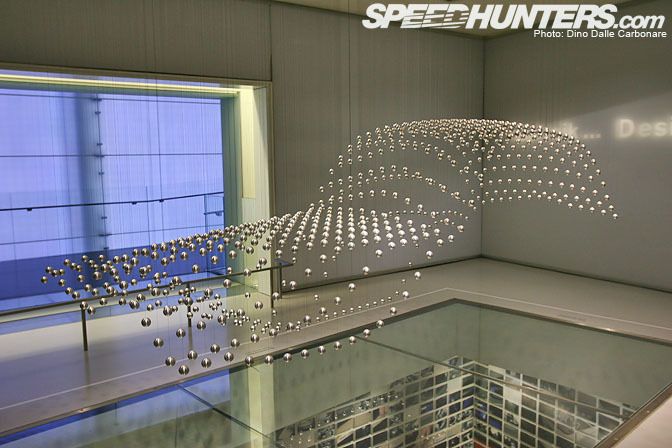 Each ball is suspended by a thin metal wire connected up to its own individual pulley and electric motor. A computer controls the movement of each creating an ever changing moving sculpture which stops for a few seconds once a shape, like the car above, is achieved. 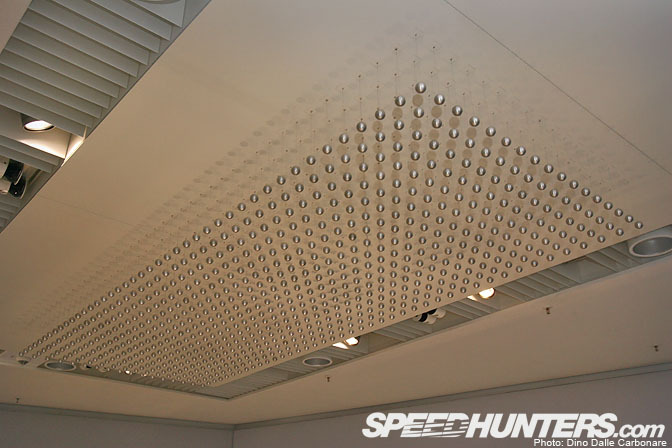 The entire device, is located in the ceiling and weighs 1.5 tons. I'd love to have this in my living room, I wonder what you can program the computer to create? 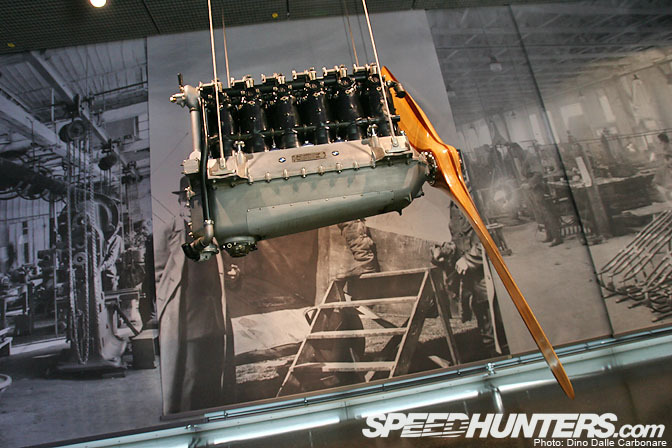 This 23L straight six, water cooled airplane engine dates back to 1918, and marks BMW's foray in the motoring world. 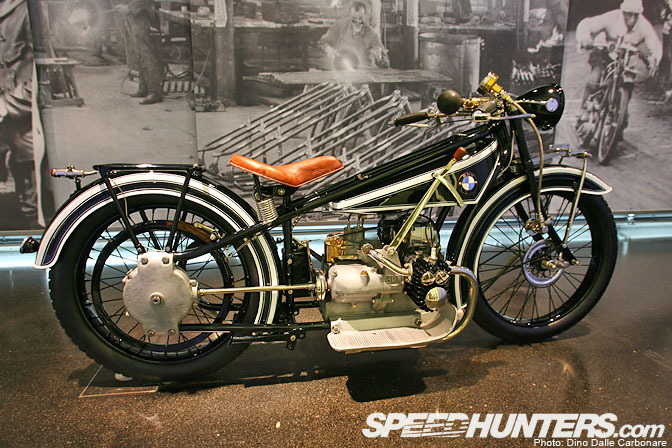 In 1923 the R32 marked a milestone in the history of BMW motorcycles as it introduced the horizontally opposed engine and shaft driven configuration still used in modern day BMW bikes. 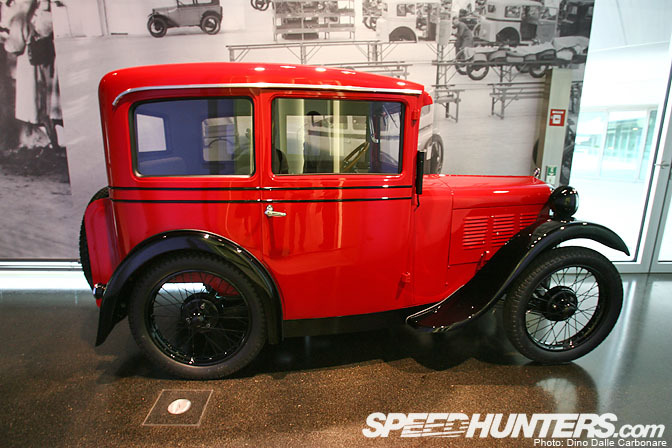 The 3/15 PS DA-1 introduced in 1927 (the later 1929 DA-2 is pictured above) was BMW's first car celebrating the beginning of its road car operations. 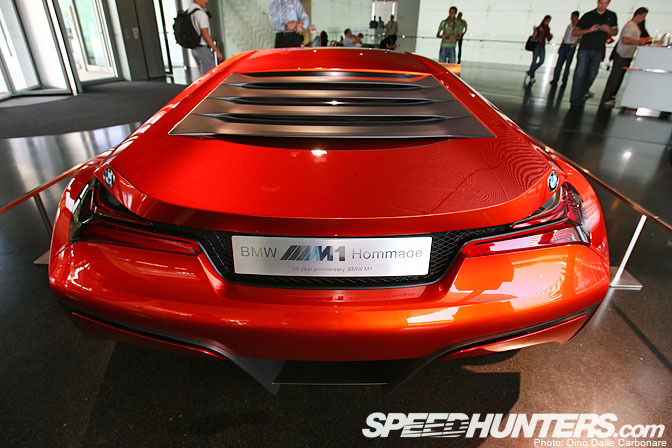 As we saw earlier, BMW has always paid special attention to building more efficient cars by reducing body weight. Back in the 50's they tested a magnesium alloy body frame which weighed 35% less than its aluminum counterpart. 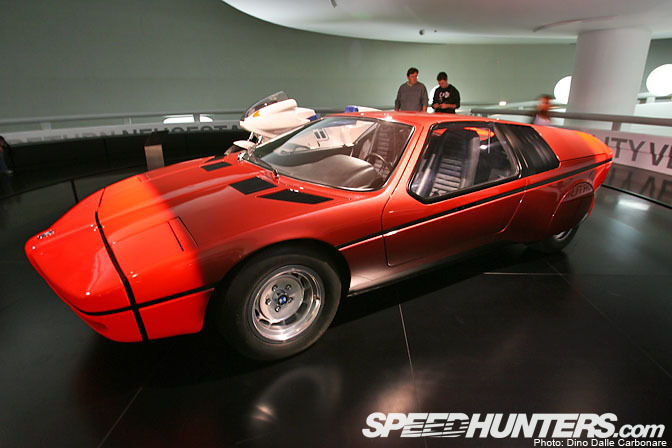 You can see a modern day interpretation of this weight management on the M6 body hanging on the wall, sporting aluminum body panels and a carbon fiber roof. Due to its flammable nature however magnesium was very difficult to work with, so the whole idea was abandoned. This Carrozzeria Touring bodied 328 Touring Coupe was raced at this year's Mille Miglia back in May by famous Italian skier Kristian Ghedina. 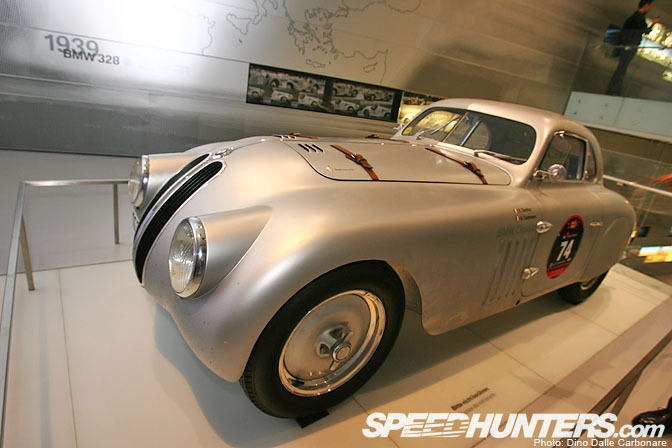 If you think it looks familiar it's because Chris Bangle used it as an insipiration when designing the Mille Miglia concept. 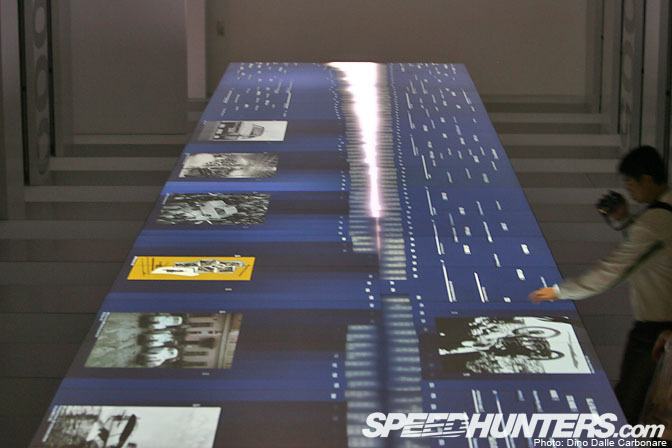 I spent a lot of time playing around on this interactive table where an image, projected from above, would "come alive" as you moved your fingers over the touch sensitive surface. 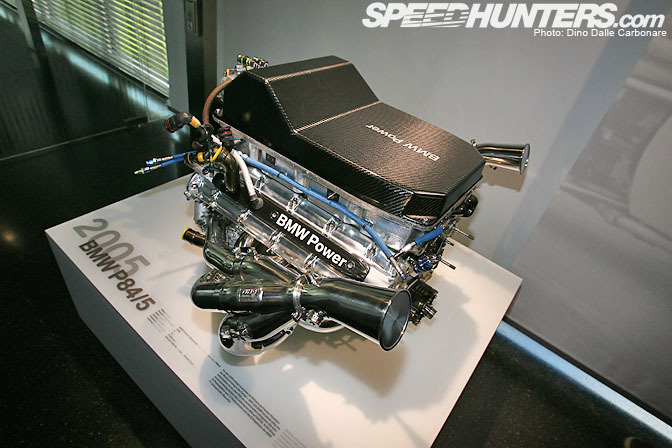 …but it's the turbocharged 4-cylinder M12 engine that powered it that really did it for me. Running up to 4.4 bar of pressure this 1.5L lump, managed to develop up to 790 HP at 11,000 rpm and well over 1000 HP in its last iteration. Absolutely crazy. 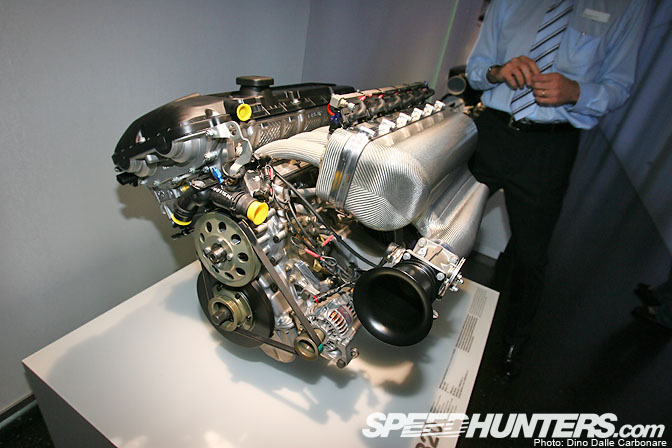 This is what a modern day F1 engine looks like, the 900 HP, 3L V10 P84/5 from 2005. 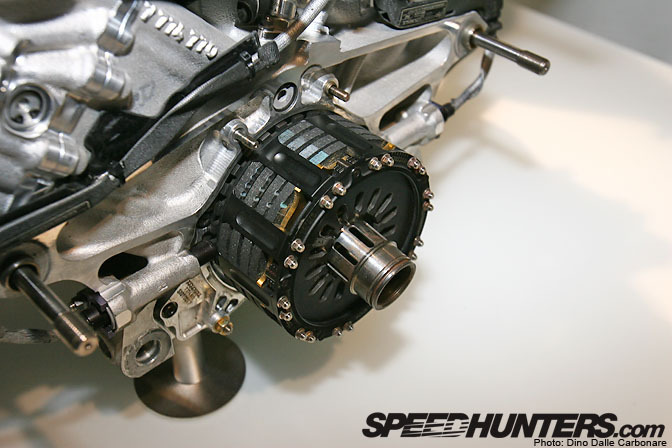 Take a look at how small the quad-plate carbon clutch is! 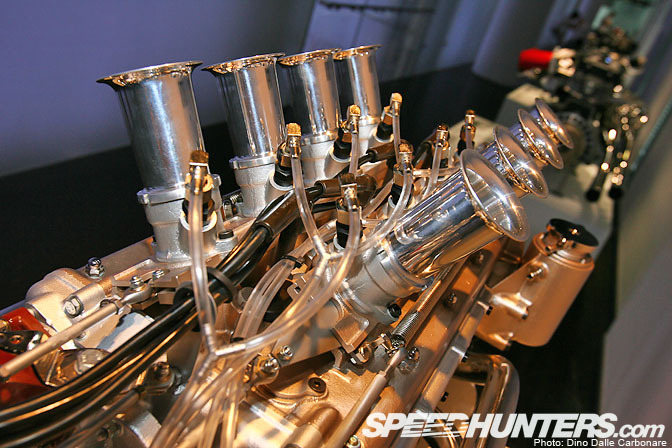 I loved the silver carbon fiber on this P54 B20 2L straight six touring car engine. 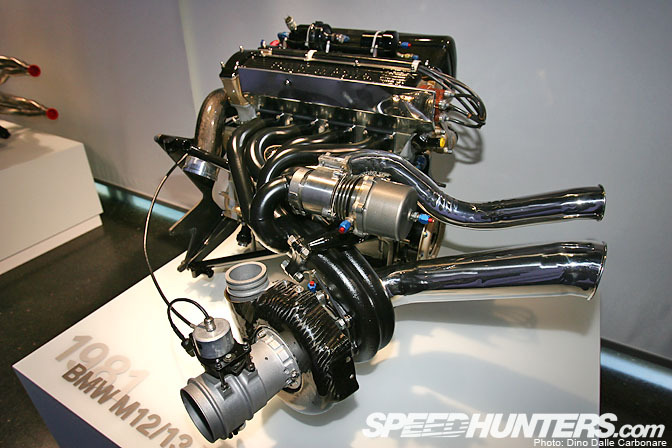 This Formula 2 twin-intake and twin-exhaust motor left me particularly perplexed. 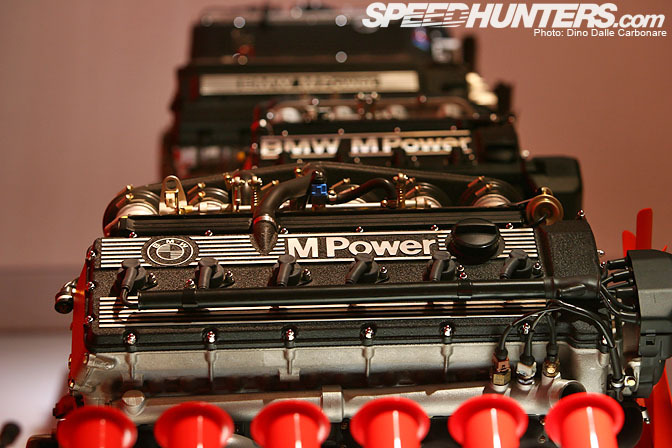 From a distance it looks like a tiny V8 until you notice the 4-cylinder block. This interesting configuration was short-lived because of its complexity, but you can't help but appreciate such ingenuity. 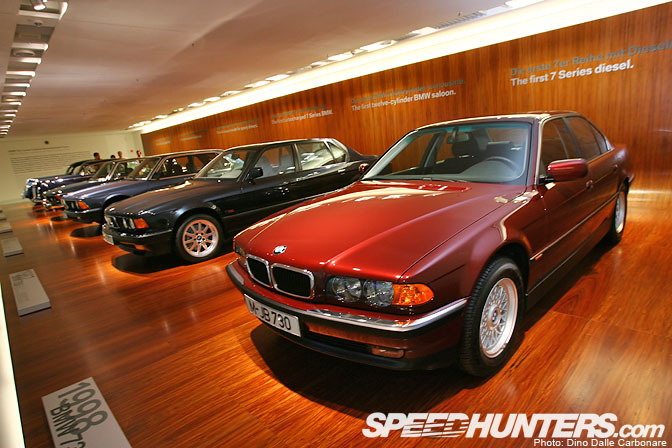 Quite liked this room that showed the evolution of luxury BMWs through history from the 1939 335 to the 1998 730d. 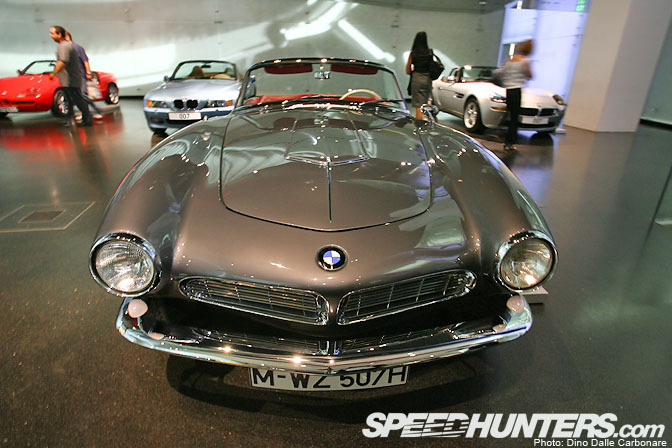 For me this is one of the most beautiful creations ever to come from BMW, the 1956 507 Touring Sport. 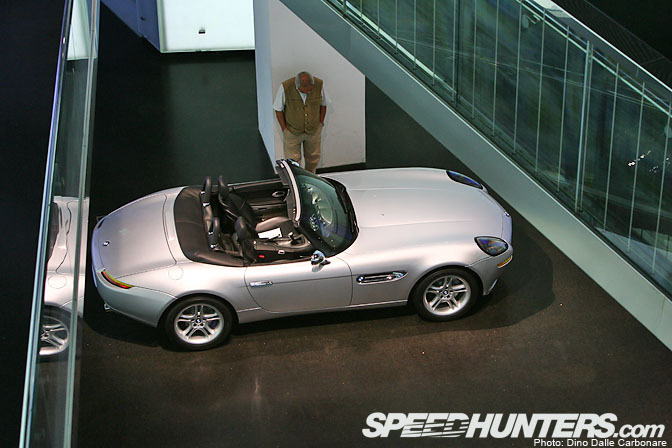 You can see the Z8 Roadster behind, the modern day interpretation of this classic. 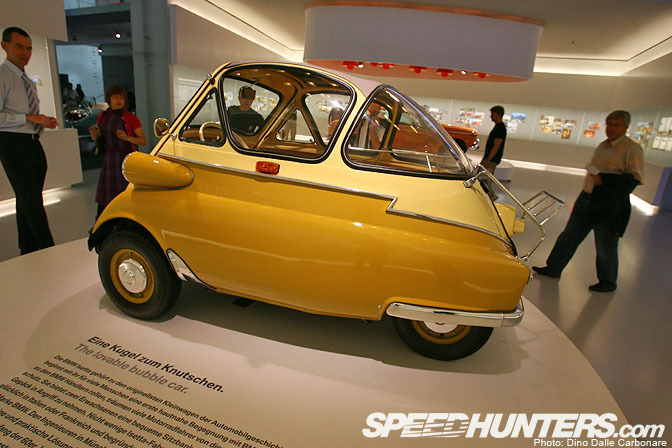 And let's not forget about the Isetta bubble car! You can't get more unique than this! 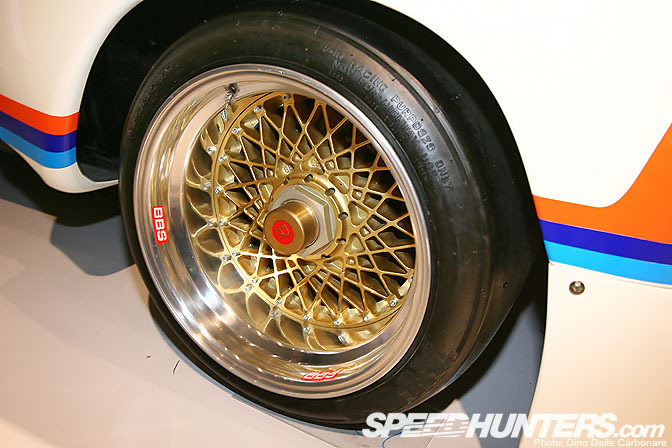 Check out the rear tires on the 1975 3.0 CSL IMSA racer car, they are 350 mm wide! 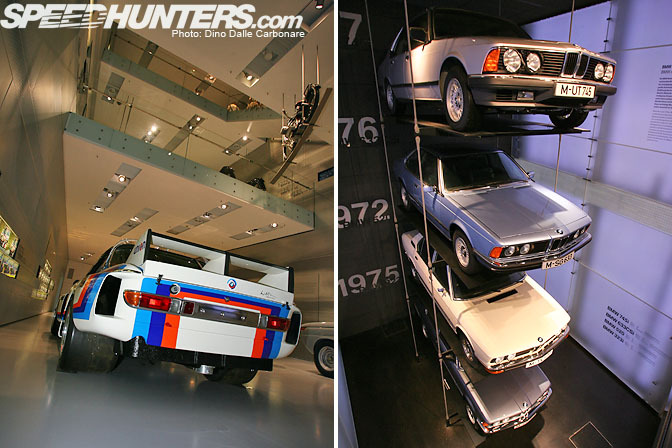 The shot on the right shows how the BMW model lineup series began to develop, from the 3-series all the way to the 7. The nomenclature is still used to this day. Now that is some serious dish! Offset could be worked on though LOL! 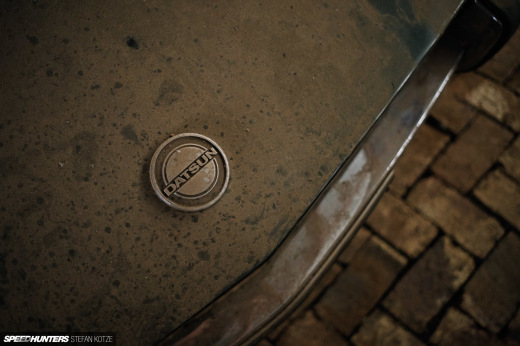 …and I really liked the no-nonsense interior, where Hans J. Stuck along with Sam Posey and Brian Redman did their work. How's that for a rear wing? 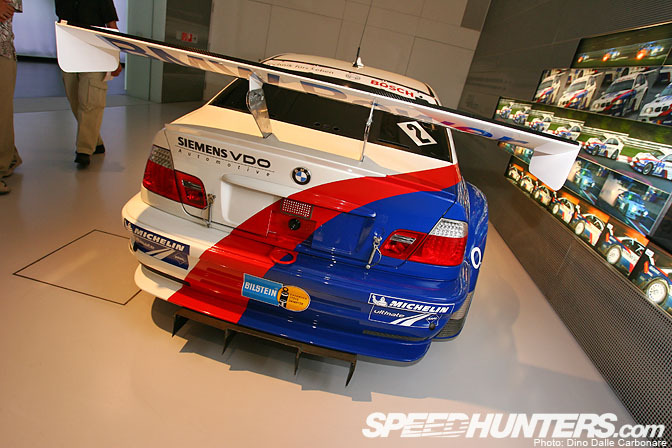 The V8 powered M3 GTR from 2004 always deserves respect, a truly mean looking machine! I'm sure this Group 5 320 was the dream car of many kids back in 1977. That wing is outrageous! 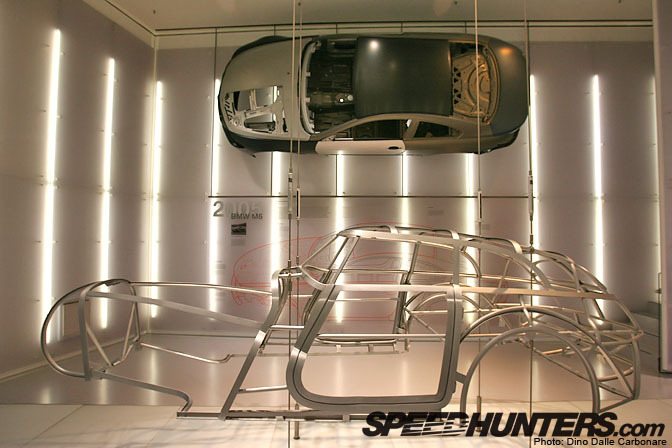 The complex layout of the BMW museum gives you some interesting viewing angles to cars displayed one or even two floors below. 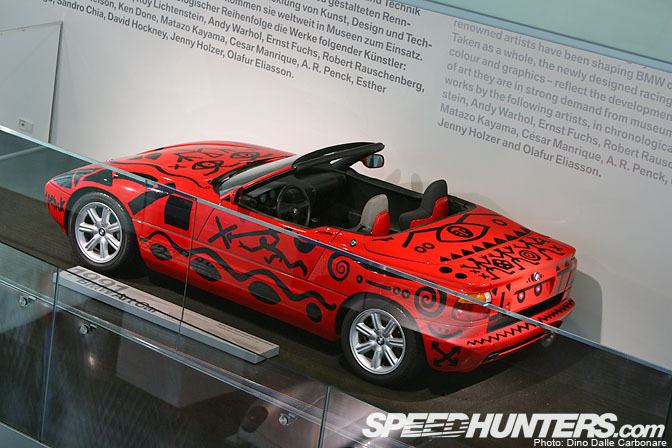 One of 17 BMW Art Cars, the 1991 Z1. 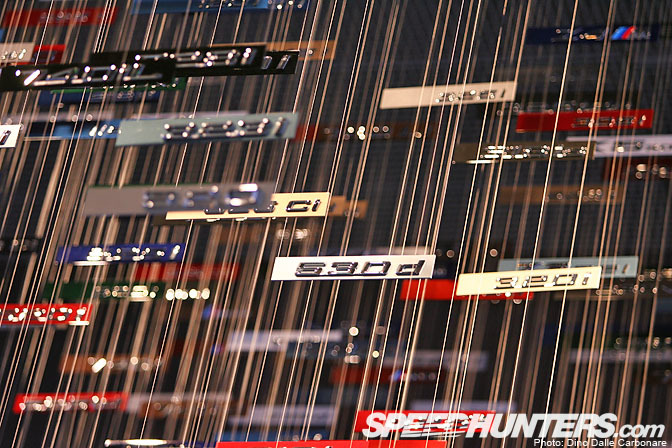 I really liked this exhibit where BMW badges throughout history are hanged on display. 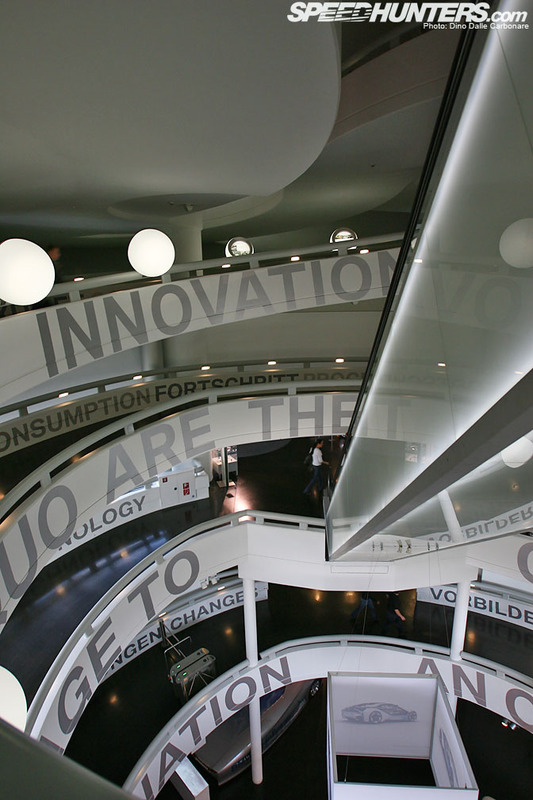 They are suspended chronologically from the oldest at the bottom to the modern day ones at the very top. …along with the engines used throughout the years on M-cars. 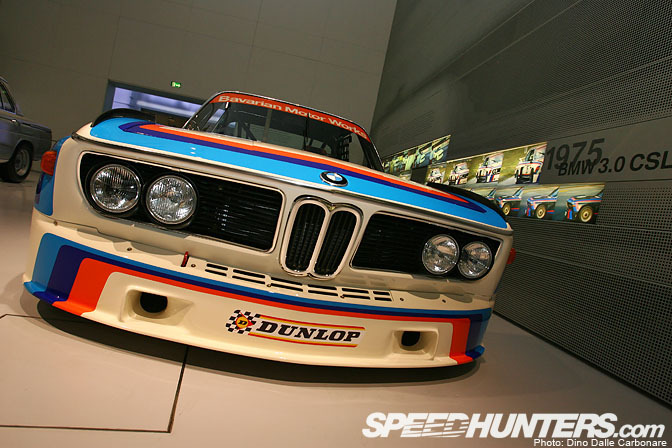 I hoped you got a sense of what the BMW Museum is all about with this extended gallery. 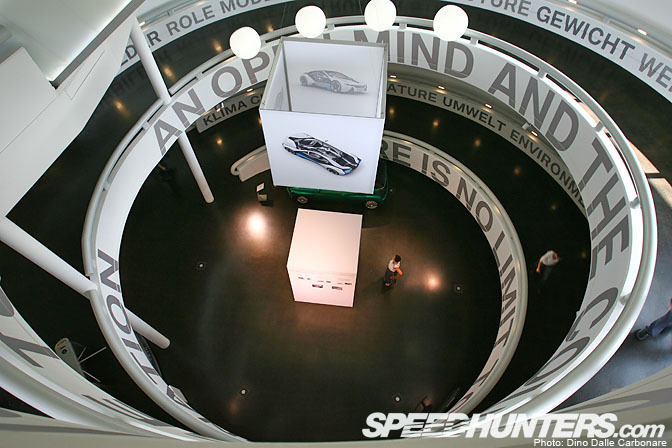 If you are every in or around Munich a trip to the BMW Welt and Museum is definitely something I'd encourage anyone to take. Not only do you get to learn about the brand but also see some pretty cool cars, you really can't go wrong with that! Can't wait to go back to Munich. In highschool I visited the old museum, it was very disappointing. This new museum looks like what I had hoped the old one had been. where can i find more info on that dual intake dual exhaust 4 banger! What an awsome pictures. I love the shot of the Hommage. 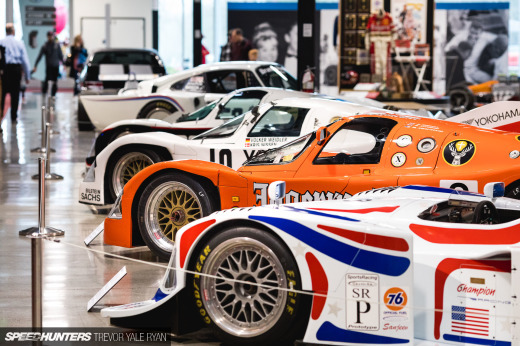 seeing the pic´s from the museum, makes me proud to be a BMW owner..
awesome museum.If i where to go i would just be staring at the m1,the e46 m3 gtr racecar, and the 3.0csl imsa car and the group 5 320 racecar. Its probably so PROUD to see something like this for Germans, they do have things to be proud of. it seems like it needs one!!! 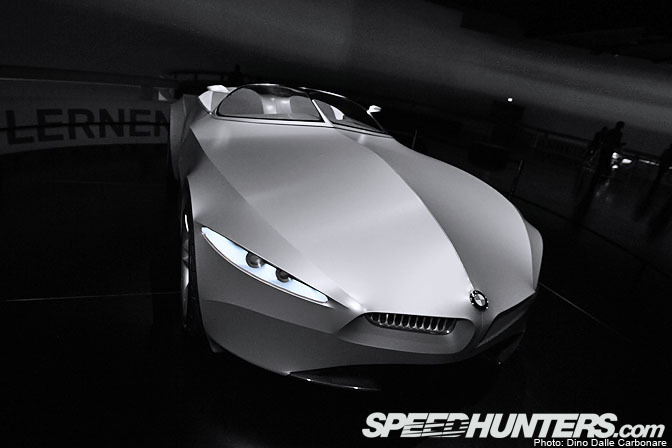 BMW , a car that should never be taken lightly. makes me wonder if next month will be Mercedes - Benz. very good feature! 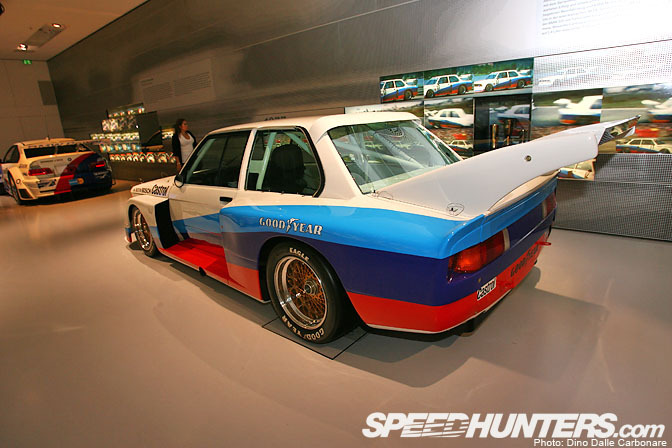 I definitly got to visit the museum as a loyal bimmer fanatic! 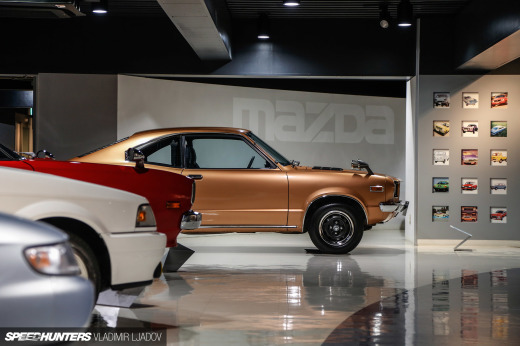 Breathtaking museum. If only I could go. Such an amazing place to be I bet. I wanna see the R50 sidecar racer! Amazing! I love the 328 and the 507! The vintage racing engines are fantastic! Where can I find more info on the dual intake/exhaust 4? I think Bangle's designs will be appreciated more as time goes by; at least his concept designs. 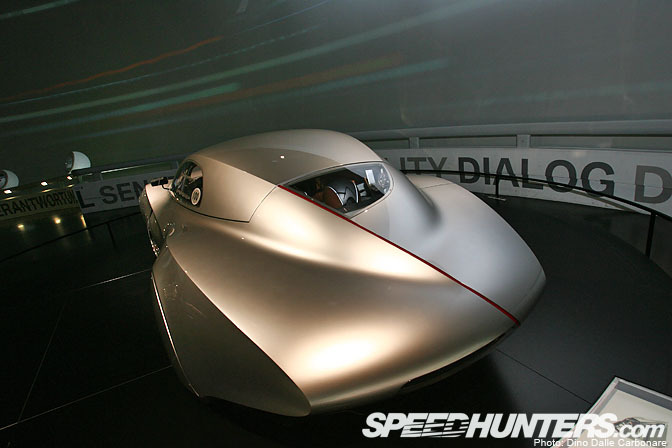 The Mille Miglia and GINA are brilliant and extraordinary! He had design genius, it was just when the designs were inevitably watered down for production that they lost their "edge". Maybe he would've been better off at a small-volume supercar manufacturer, than a global mass production corporation. I could almost see him working at TVR, hmm..... BTW, I love the R32 (yes, I'm a bit of a vintage bike nut! ), the drivetrain looks so delicate. Then again, the belt drives that contemporaries were using were anything but robust. v5KP8A I want to say - thank you for this!